myLoc Review 2019: Is myLoc a Good Hosting? myLoc Managed IT AG offers a range of specialized hosting and IT solutions for businesses in Germany. They can easily accommodate enterprise-scale operations that demand the best-performing servers and networks at an excellent price-to-performance ratio. myLoc Managed IT AG has been providing hosting solutions out of Dusseldorf since 1999, which makes them one of the oldest hosting providers in the country. In 2006, they were acquired as a subsidiary of Virtual Minds AG. 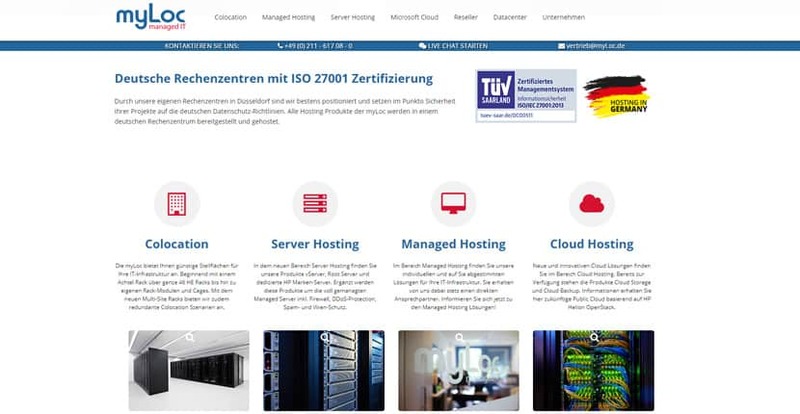 In 2009, they merged with Fast IT GmbH, which allowed them to become the versatile hosting and IT solutions provider they are today. They now have three Tier 3 data centers located in Dusseldorf, from which they host all of their customers. They operate in both German and English. It’s important to note here that myLoc Managed IT AG doesn’t really cater to individuals and small businesses looking for a simple shared hosting service; rather, they’re better suited to larger enterprises or businesses with more complex requirements. They’ve got managed hosting, cloud hosting, dedicated servers, and colocation services — all of which require you to have a decent level of technical proficiency to operate well. With most of their services, myLoc Managed IT AG places a heavy emphasis on customizing a solution for your business. This means that unlike with a typical hosting provider, you won’t be able to simply select a pre-made hosting package for the most part: you’ll have to contact them directly to work out a package. Unfortunately, this means that there’s very little information on how easy their platform is for users to learn, nor any uptime guarantees or standard SLAs available. You’ll have to enquire about specific SLAs when you’re customizing a package with them. That said, you can rest assured that if you do choose myLoc Managed IT AG as your provider, they’ll offer you a high level of service. In fact, their data centers are ISO 27001 certified, which means they’re internationally recognized to have top-notch information security and management. myLoc Managed IT AG provides a wide range of server solutions, each with their own pricing structures. They offer monthly to biennial contracts with most of their plans, as well as 30-day free trials with a few (namely, their cloud backup servers and Office 365 packages). As a premium hosting provider, myLoc’s packages don’t come cheap by any means. However, they do have more affordable vServer and root server plans for those who aren’t ready to scale up to a dedicated server just yet. All plans come with 24/7 technical support that’s offered via live chat, German telephone lines, and email. Although this seems great, their support staff can be very patchy and it often feels like they don’t really know their own packages that well. You also feel like their support staff are slightly overwhelmed as they can take a long time to reply to queries. There are few better options than myLoc Managed IT AG if you want a hosted IT solution for your business that’s housed in highly secure, colocated data centers. However, the poor support might be a turnoff for those who don’t have their own IT teams. Wondering how myLoc stacks up against other Web Hosting companies? Enter any other Web Hosting company and we will give you a side-by-side comparison.